If you’re a homeowner, whom do you call when you find mold in a closet and on the ceiling of a bathroom? How about when paint starts peeling on your dining room wall? Whom do you call when there’s standing water in your crawl space? Whom do you think to contact when it’s getting harder and more expensive to keep the house warm in the winter? The average homeowner probably doesn’t know where to turn. In my position as the program administrator for the California Building Performance Contractors Association (CBPCA), I have been intimately involved in getting the home performance message out to both contractors and homeowners. 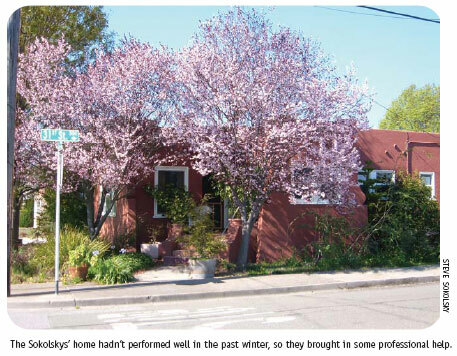 But I’m not a contractor myself, and my own home in Richmond, California, wasn’t performing well during the winter. Luckily I knew whom to call, so I enlisted the help of Applied Home Performance, a CBPCA member contractor in my area. First, some background about the house. My wife and I own a 1,171 square-foot one-story house that was built in 1929. Significant features include lath-and-plaster walls; a 1940s vintage gravity furnace without a thermostat (a key regulates its operation); a complete absence of insulation; a flat tar-and-gravel roof; an unsealed, 30-inch-high crawl space; and a 20-inch-high attic space. The only home performance upgrades I had completed were installing double-paned windows (more to cut down on noise than to save energy) and replacing the water heater with a tankless model. We’ve lived in the house for eight years with our dog, our cat, and my wife’s many orphaned plants. Winters in the San Francisco Bay Area require some mechanical form of heating, and we found that the gravity furnace was adequate for meeting most of our heating needs.We’d turn it on when we were home in the evening and often kept it on low throughout the night.However, the furnace is very inefficient. We’d usually have one or two months each winter where our heating bills would reach $150–$200. But this past winter brought significantly higher natural gas rates—which meant we needed to ration our furnace use. So we rarely kept the furnace on throughout the night, opting to wait until we woke up to turn it on. Blankets and sweaters helped us survive the wet and cool winter. But the lower interior temperatures brought some bad (but predictable) consequences to our home, such as condensation on the windows and doors and “ghosting” along the ceiling surfaces. Mold started appearing on the ceiling of a closet and along the ridge of the ceiling in the other bedroom, where it adjoined an exterior wall.The coup de grace was when paint started to peel in the dining room, along another exterior wall. That was when I called Robert Mitchell of Applied Home Performance. Robert and Kevin Beck arrived on a Monday morning in early March and proceeded to performance-test the entire house.The first startling finding was that the relative humidity (RH) indoors was 85%! The second was that the surface temperature on the dining room wall was 56°F while the rest of the house was about 62°F. Visual inspections of the roof, attic, and crawl space revealed cracks in the roof parapet, significant moisture on the sidewalls of both the attic and the crawl space, and even some standing water in one corner of the crawl space.The ground in the crawl space was very moist along the edges. Finally, the fireplace chase was unsealed on both top and bottom. Robert and Kevin then ran a blower door test that revealed our one positive piece of news: Infiltration was relatively low, due to the lath-and-plaster walls and double-paned windows. Infiltration was measured at 1,290 CFM (cubic feet per minute) at -50 Pascals, equating to 0.34 ACH (air changes per hour). Since the gravity furnace didn’t use ducts, a duct test was impossible. Based on their tests, our course of action became obvious: Get the house warmer and drier. This meant sealing the crawl space, upgrading (actually replacing) the furnace and making it controllable, insulating the attic with blown-in cellulose, upgrading ventilation in both the kitchen and the bathroom, repairing the roof leaks, and sealing the fireplace chase. Before any work was started, Robert left two data loggers (one inside and one in the crawl space) in order to measure temperature and RH over a 10-day period. The captured data confirmed our fears. Temperature in the house was consistently between 57°F and 63°F (much lower in the crawl space), and RH was always between 65% and 85%. No wonder mold was starting to grow. Soon thereafter, Robert and his crew started the retrofit. The first task was cleaning and sealing the crawl space. Insulation was installed on the sidewalls, a vapor barrier was put on the floor, and all framing gaps were sealed. A small ventilation fan was also installed in the crawl space. The fan is vented to the outside through an existing vent opening that was then sealed all around. Then we had to decide what type of heating system would replace the gravity furnace. A Manual J calculation revealed that our home’s heating load (assuming a sealed crawl space and R-38 insulation in the attic) was only 27,000 Btu per hour. [Manual J is the name for a specific protocol used to determine how much heating/cooling a home needs to stay cool and dry in the summer and warm in the winter.] One option was a hydronic/radiant heating system that would run off the water heater and require a small air handler. However, our tankless water heater was a poor match for the hydronic system, and the labor costs for installing the radiant tubing were more than we wanted to spend. Therefore, we decided to install a 35,000 Btu per hour, 94% efficient, sealed-combustion forced-air furnace in the crawl space along with the requisite ducts and registers. A programmable thermostat would give us all the control we’d need. With work down below progressing smoothly, we tackled the attic next. The attic floor was cleaned and sealed, and the attic vents were screened to keep out rodents. That’s when we were hit with a big monkey wrench. At one spot on the underside of the roof there was significant condensation—evidence of a sizable roof leak. A roofer who works with Applied Home Performance did a closer examination and discovered that the last application of tar and gravel in 1997 did not include a complete tearoff of the previous roof. Gravel was penetrating the building surface, causing the leakage. Since the lifespan of a tar-and-gravel roof is typically 10 years anyway, we discussed a new tar-and-gravel application with Applied Home Performance. But then a chance meeting sent us in a different direction. The next day I attended a CBPCA meeting and ran into Mitch Fine, the owner of Armstrong Foam Roofing in Emeryville, California. Armstrong has been installing sprayed polyurethane foam (SPF) since 1980, and is one of the largest residential installer of SPF in the United States. In addition to having excellent insulating and reflective properties, SPF has a much longer life span, as a waterproofing membrane, than traditional tar and gravel. SPF roofs can last 50 years or longer, as long as they are protected with a UV coating, which should be applied every 12 to 15 years. The costs associated with SPF are about 40%–50% higher than the cost of tar and gravel, but the paybacks (through longer life and better insulating performance) more than make up the difference. The 1 1/2- inch-thick spray application is an integrated insulated roofing material delivering R-9 without any seams or layers. Scott Proctor of Armstrong inspected the roof three days later and told us that it was an excellent candidate for SPF. The flat surface made for easy application and the spray-on foam would eliminate the need for regular patches to the parapet. Armstrong would need three days to complete the installation, but the installation couldn’t happen until the rain stopped and Armstrong caught up on its backlog. This was a particularly wet winter and spring season in the Bay Area, a place where rain is rare between early April and late October. At this point the retrofit was becoming more extensive, complicated, lengthy, and expensive. Our routines were disrupted—my wife works part-time and was home often as the workers moved in and out of the house. But we trudged on. Cutouts were made for five registers. The new furnace was installed in the crawl space along with R-8 metal jacket flex ducts. The small ventilation fan in the bathroom (which was found to be disconnected in the attic!) was replaced with a Fantech inline model, controlled by a timed motion switch. The new fan included a Y-joint, so that an additional vent could be placed directly above the shower stall. The fan was so quiet that we couldn’t tell if it was actually on. A new 1,200 CFM range hood with an inline Fantech motor was installed in the kitchen and ducted outside through the attic. This hood was necessary to increase the removal of moisture and to replace a small exhaust fan that was inadequate to meet the needs of our 36-inch gas stove, which has four burners and a range top grill. We performance tested the range hood by grilling chicken pieces (with the skin intact) and sausages in order to generate as much smoke as possible. The hood worked like a dream and a Fantech inline silencer greatly reduced the noise in the kitchen…quieter than most bathroom fans! After a week of sunshine and temperatures in the high 60s—enough to dry out the attic—the crew from Armstrong arrived to start the roofing process. First, all of the gravel was cleaned off, making the existing surface as smooth as possible. Next, all protuberances and cracks were sealed. Finally, the SPF and coating were blown onto the roof surface. It’s amazing to watch the spray-on process—the foam is sprayed very thinly and it expands and hardens immediately. The SPF covers the complete roof surface, including the wall and cap of the parapet. Home performance contractors would be wise to investigate SPF roofing and recommend it in the right circumstances and applications. An SPF roof can reduce attic insulation requirements and is ideal in certain climates. The retrofit work was completed in early May. All of the equipment worked as advertised. The attic insulation made the house feel cozier immediately. The nights where the temperature inside the house dips below 60°F are gone, thanks to the easily programmable thermostat and the excellent installation of the insulation, furnace, and ducts. (A Duct Blaster test after installation showed that duct leakage was only 3.6% of fan flow or 24 CFM25.) And now we’re actually looking forward to the colder weather, knowing that our house will stay comfortable and dry. We’re also looking forward to the lower utility bills. This typical home performance job illustrates some important lessons for both homeowners and contractors. First and foremost, if you’re a homeowner, don’t ignore small problems that can turn into big ones. This includes the first evidence of mold and condensation. Second, look for someone who understands the value of diagnostics so that all prescriptions are well founded. The Home Performance with Energy Star Web site is a good place to start your search. Third, if at all possible, make sure that your contractor continues the testing process during and after the job. This ensures high-quality installations. 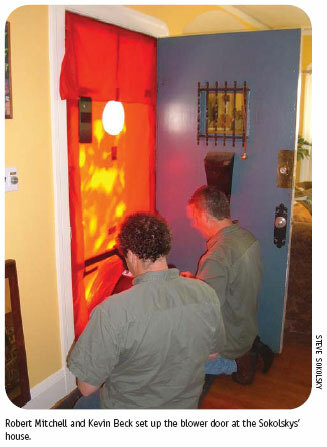 This article appeared in Home Energy magazine.